All new students commencing a Master's programme will be enrolled for the compulsary courses. This will be done in the orientation week by the Student Information Desk. You must enrol for the optional courses of the 3rd period yourself. Enrolment for your Master's thesis is done via a different procedure. As a U.S.E Master's student you can enrol for a maximum of 3 courses per period. You register for courses in OSIRIS. You can only do so during a registration period. Download here the academic calendar, including information about enrolment dates. Non-teaching Days: no classes, tests and resits scheduled. Group or individual arrangements can be made if so agreed upon by both the student and the teacher, e.g. handing in an assignment, doing a resit or receiving feedback. Christmas break: no classes, tests and resits. Students do not have to be available for teaching or study activities. Summer break: no classes, tests and resits scheduled. Courses/educational activities offered (in part) by other faculties than Utrecht University School of Economics may diverge from this year calendar. Those who want to plan ahead can consult the multiple year overview for the starting dates of the semesters, blocks and the Christmas break. Note: no rights can be claimed from the information in this calendar. You can find your personal schedules in MyTimetable. The CoursePlanner can help you plan your academic career. When registering for courses you must select courses from different time slots to prevent having to take lectures, tutorials or exams at the same time. The time slots allow you to make up your own schedule. The picture on the right shows the week's division in different time slots. How to use time slots when registering for courses? You will find the most recent available courses, registration codes and matching time slots in OSIRIS. If a course is indicated by a combination of letters (for instance C/D), then the course is in both slots and you have to make sure that your other courses are in the other slots (so A and/or B). Not all the hours of the time slots are used for teaching. In the OSIRIS registration screen you will see in which time slots the course is available (A, B, C, D of E, or a combination of these). 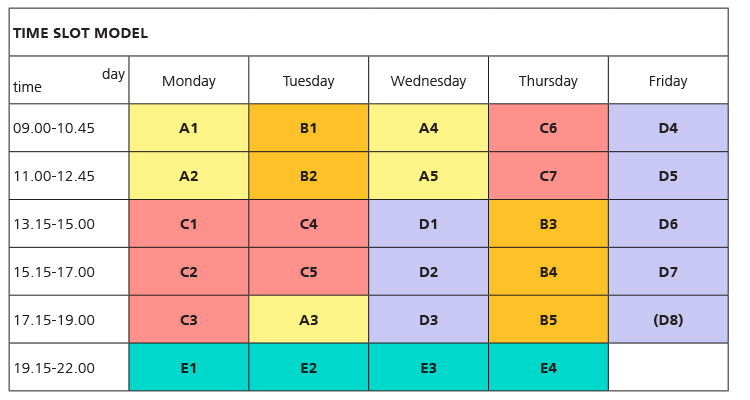 Course registration in identical time slots may lead to overlap in teaching and/or testing. So make sure to register for courses that do not overlap. If an exam is scheduled outside the regular course schedule, it can be scheduled according to the exam time slot model. These times are different from the course times. If you have registered for a course in which, on second thought, you do not wish to participate, please deregister as soon as possible, so that a fellow student can take your place. You may deregister in OSIRIS until the end of the second week of the period in which the course is taught. After that it is no longer possible to deregister and 'NP' (Not Participated) will appear on your Study Progress Review. If you want to terminate your enrolment in the degree programme, you need to submit a 'Request for de-enrolment' in Studielink (under 'My degree programmes' > select the degree programme for which you want to terminate your enrolment > 'Request for de-enrolment'). Studielink will subsequently send you a confirmation. Before you do this, it is helpful to carefully read exactly what you need to take into account.